My name is Alison and I am addicted to the Just Ripe Dixie Biscuit. And thanks to a visit last Fall, Laurie is too. So you don't live in Knoxville? No worries. I am here to help you recreate this masterpiece. It won't be a perfect rendition but it will be close. Just Ripe is the perfect spot in my opinion. When we are craving a good brunch/lunch on the weekend (or whenever really) we hit this place often. 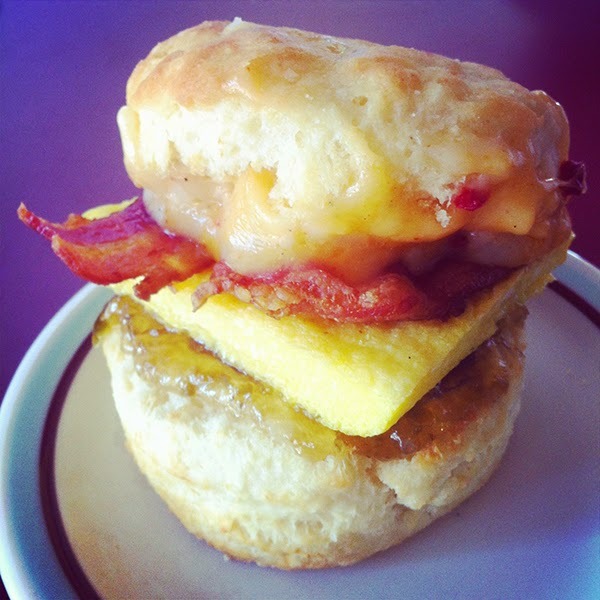 The Dixie Biscuit is a perfect combination of sweet, spicy and savory wrapped in on delectable biscuit. This delectable biscuit is made complete with pimento cheese, bacon, and pepper jelly. I always have them add a bit of their egg frittata as well. We made our own version with a bagel this past weekend. Whatever the carb of choice, just add the other ingredients and you will be golden. Benton's bacon is an ingredient all East Tennesseers use.